The Liturgy Committee* offers consultation to the homilists and music director regarding homily content and hymn selection. The Committee also is involved in developing season decorations and environment for the Church and the Commons area. Ushers* assist those needing help in being seated at services, select people to bring the bread and wine forward at Mass, and take up the collection. Altar Servers (Acolytes)* assist the priest at Mass. 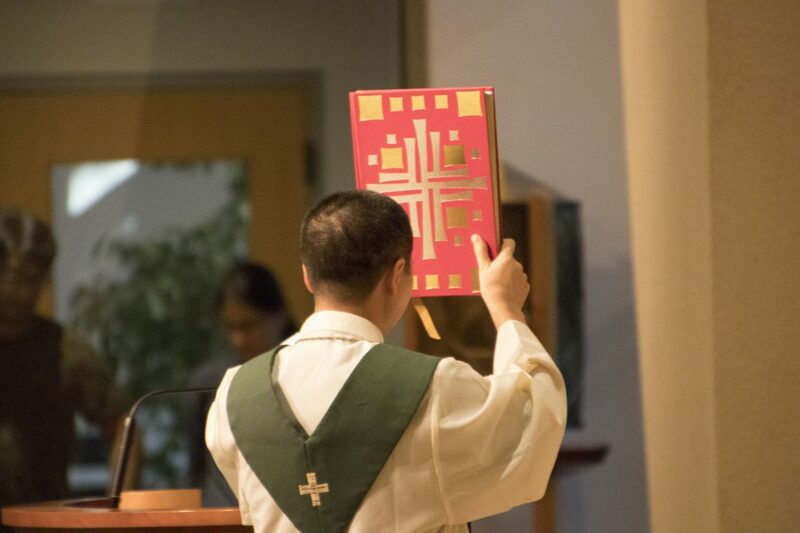 Lectors (Readers)* proclaim the Scripture and read the offertory prayers at Mass and other services. Ministers of the Eucharist* assist with the distribution of Holy Communion at Mass. Choir Members and Musicians* exercise their ministry at Mass by singing and/or playing instruments. They are expected to be with the choir each week at Mass and attend weekly rehearsals. Sunday Sacristans* prepare the Sanctuary for Masses at Sunday services and other special Eucharistic celebrations. Home-Bound Ministry*** trains and organizes parishioners to take the Eucharist to members of the parish who are confined to their home or a nursing home or temporarily in a hospital. Through this ministry homebound parishioners are united with the whole parish community at Mass. Baptism Hospitality Ministry meets families that are arriving for the baptism of their children and reminds them of the important things to know. They help the families feel comfortable with the ritual before Mass begins.